Regardless of the type of vehicle you have, there is always a chance that you may need to jumpstart its battery. Although jumpstarting a car’s battery is fairly easy, the process can be slightly dangerous if basic precautions are not considered. Thus, calling a company that provide such kind of service is highly recommended. In San Rafael, Newway Towing is the best company to call when it comes to jumpstart battery services. With 24/7 availability and a fast response time, clients are assured of getting the help they need. Newway Towing offers excellent services for roadside assistance and towing, provided by licensed and professional technicians who have years of experience in this field. The techs we cooperate with will provide you with just the type of service you hope to get and all for a price that’s hard to beat. When the car stopped suddenly due to its battery, you will never get wrong in calling Newway Towing. We have been offering our services 24 hours a day in 7 days a week or 365 days a year to ensure that drivers in San Rafael can seek help at any time of the day. The need to jumpstart a car’s battery may happen in an unexpected circumstance that is why, we make a commitment to serve the community round the clock. No matter what time of the day that a client calls, we will respond as quickly as possible. On top of that, we promise to arrive on time to make sure that drivers can get back on the road right away. Just let us know your location and give us the necessary details for us to respond in a short span of time. Our jumpstart battery services are provided by our licensed and professional technicians who have undergone various trainings and years of experience. These people are qualified and reliable individuals who can help your car’s battery function again. They are experts in any roadside assistance and towing problems. Aside from that, they are equipped with the right tools and advanced equipment. We are proud to say that our technicians are one of the best in San Rafael because they thoroughly assess the car’s condition and make sure to provide the right solution for such vehicle problem. Whatever kind of battery you have, you can be assured that it will start and function again. 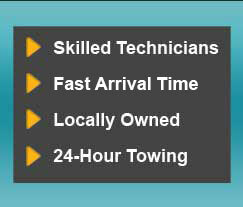 At Newway Towing, we are dedicated in providing quality services at a reasonable price. We do not charge any hidden fees and we make sure that you pay the right amount, no matter what kind of service you avail. Our people are friendly and honest employees who will ensure to provide the best for your vehicle without compromising your budget. Call us now and try availing our roadside assistance and towing services. We will be pleased to serve you and provide you with the best solutions for your vehicle’s needs. We, at Newway Towing, wants to create a long list of satisfied customers so call us right away and experience the services you always wanted for your car.